Molly with the Sonoma County Regional Parks van wrapped in her art. "I am a Northern California artist whose love of nature has developed into a long career as a wildlife artist and conservationist. My community work has given me the greatest pleasure. Sebastopol Mural, Llano Treatment Plant Mural, the Pediatric Room of Sonoma West Medical Center and Sonoma County Regional Parks Van. The beauty of my local environs, particularly an unrelenting fascination with Mount St Helena, has inspired my landscape painting. The love of birds, reptiles, eggs and political parody are favorite subjects as well. My mediums enjoy variation as well: Lithography and serigraphy, pen & ink, acrylics, oils, watercolor, and gouache: on variations of substrate—in any combination that may develop. The continuity of the natural world with its fantastic variations and specific adaptations for coexistence offer humanity a forgotten sense of balance. There is also a sense of joy and wonder—this is what I hope to communicate through my art." 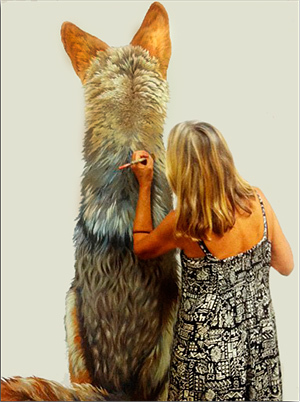 Preparing Coyote for the mural in my studio. 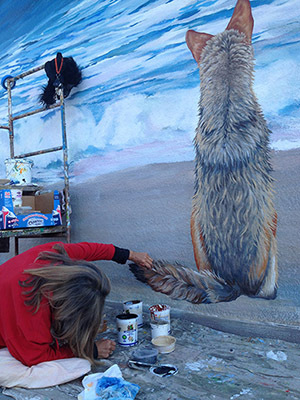 Painting Coyote on the Sebastopol Mural.